The Filton Bank 4 Track project increases the number of tracks from 2 to 4 between Dr Days and Filton Abbey Wood Station in Bristol. Two of the original four rail tracks had been removed in the 1980s but major improvements were required in order to restore 15km of twin track, including signalling, track bed and infrastructure works. 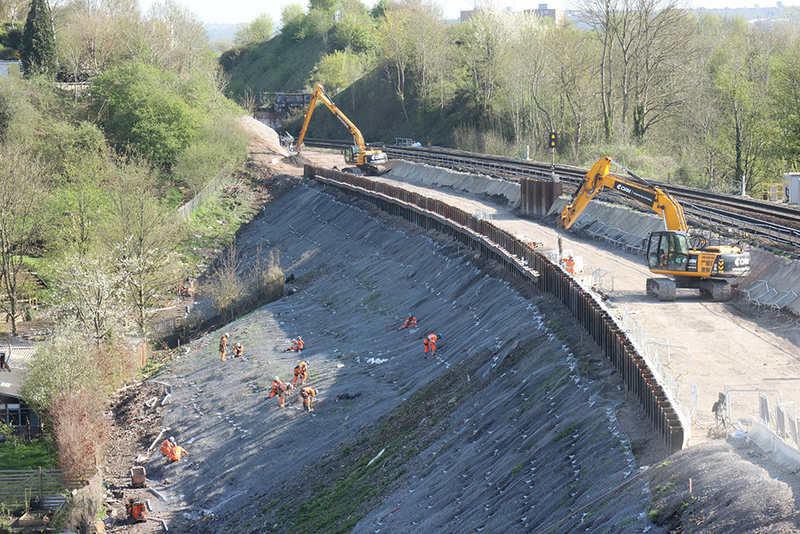 CAN was contracted to carry out a number of cutting and embankment earthworks projects to allow an increase in the width of the track bed over the scheme length. Ashley Hill South Embankment is 300m in length with existing properties restricting access to the toe, and the proposed new track alignment extended beyond the existing crest line. 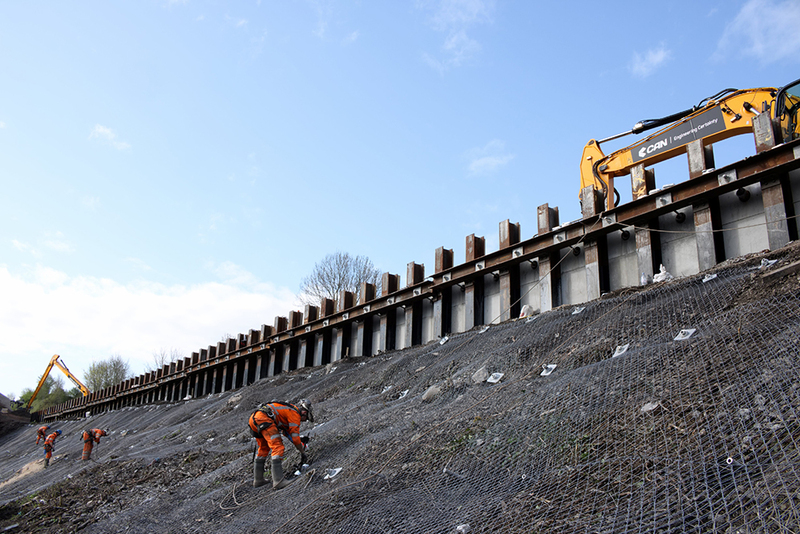 The design solution was to widen the crest of the embankment with a retaining wall, and reinforce the slope below with soil nails and a Tecco netting facing. Working from a narrow access track along the crest of the cutting demanded a complex programme of works to take account of the limited space and inability for large plant items to pass each other on the worksite. The adjacent to live rail lines added additional complexity, requiring much of the pile driving to be completed in night time possessions. Over 1400 no. soil nails up to 20.5m in length were installed in difficult mixed ground conditions along the embankment, utilising A-frame drill rigs on the slope and under reaching excavator mounted drill rigs from the crest. Up to 6 drill rigs were operating concurrently, working efficiently in a carefully planned sequence. The retaining wall consisted of 178 no driven steel H section piles up to 7.5m overall in length, installed to extremely tight tolerances by CAN’s specialist subcontractor SPI Piling. 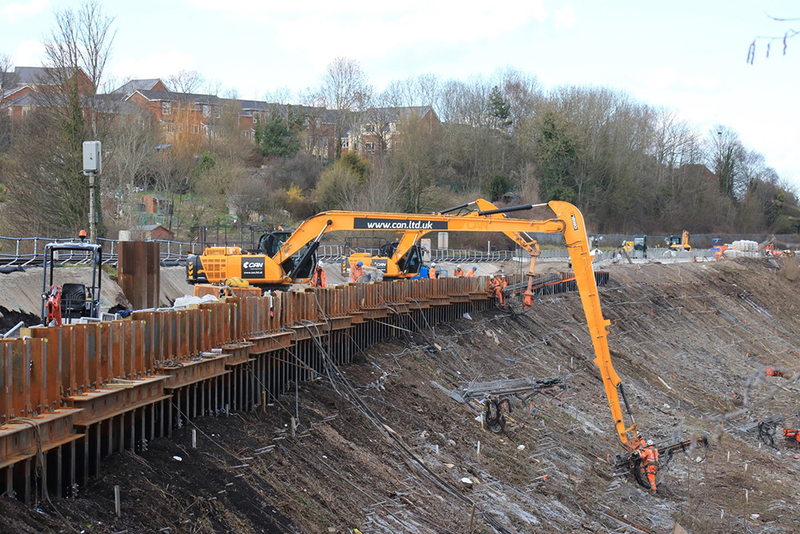 The piles were linked together in groups of 5 by steel waling beams, and 150mm thick bespoke reinforced concrete planks were installed on the rail side of the piles to create the retaining wall. With a height of up to 2.5m, raking soil nails of 13.5m and 14.5m length were drilled through the waling beams and clearance holes in the concrete planks, to provide additional restraint against overturning. 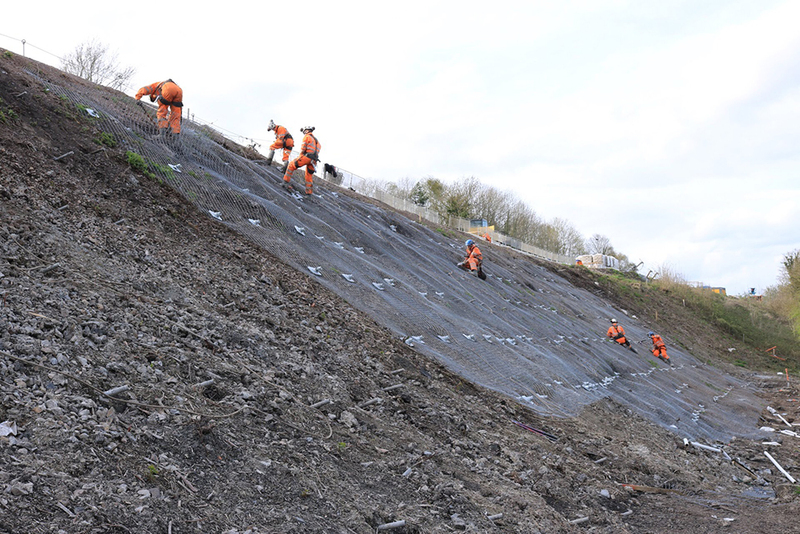 A geotextile membrane and compacted 6F4 fill was installed behind the retaining wall up to new formation level ready to receive the new track bed and a key clamp handrail was then installed along the length of the retaining wall. Despite the difficulty of access and site logistics, the works were completed on time and budget to stringent quality standards.